The Disintegration of the Persistence of Memory is the companion of The Persistence of Memory, the painting that everyone knows with its pocket watches melting away in a wasteland. This oil on canvas painting, created in 1954, is only 10 by 13 inches, only slightly larger than a sheet of legal sized paper. If anything, it’s even more fascinating and mysterious than The Persistence of Memory. In this painting, the arid landscape of The Persistence of Memory has been flooded, even though the skin of the water is snagged by the leafless branch in the background. The water is clear and calm enough to mirror the cliffs in the distance, even as it bisects the one jutting rock in its center. The bottom half of the picture is dominated by bricks that float in orderly rows both under and over the water and form a sort of mortarless wall on the left side of the painting. This wall in turn begins to disintegrate as it spreads leftward. Some bricks furl up into darts that seem to bedevil a melting watch that is beneath the water and the melting watch that hangs from a twig of the branch in the foreground. The stem and twigs, though severed from each other, float in space as if they are still connected. Beneath the surface of the water, another watch is coming to pieces over a bleached version of the creature seen in The Persistence of Memory. Yet another melted watch has sunk beneath the layer of bricks, leaving bits of detritus behind. A fish seems to hold up the reflection of the cliffs as it swims, unconcerned, through the water. The painting was allegedly inspired by Dali’s fascination with nuclear physics, and in its own way depicts the quantum world, where things both come together and come apart at the same moment and flicker in and out of existence. The painting represents a farewell to Dali’s interest in surrealism as he turned more and more to the contradictions and strangeness of nuclear physics. 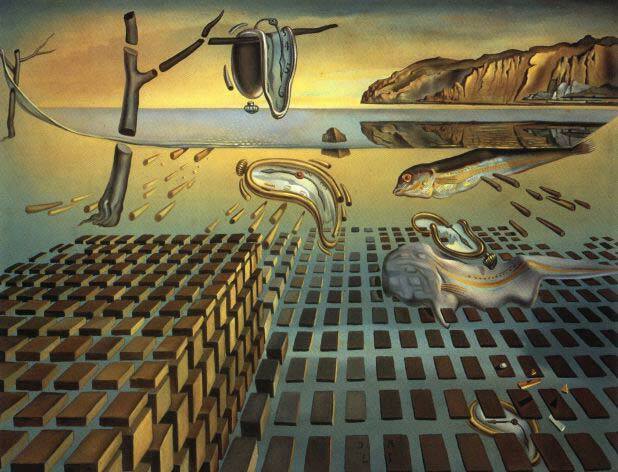 The Disintegration of the Persistence of Memory is now in Florida’s Salvador Dalí Museum.